I am currently toying with a visualization for understanding a basic statistical concept. Part of me was wondering if it was worth it, based on the simplicity of it, but another part of me thinks it might help someone at some point in the future. Plus, as it will be a D3 visualization, I will likely learn something new as well. This got me to thinking about how some things might be fairly obvious to oneself, but others are just trying to learn about it, or are at a place in their own educational path where something will finally resonate. 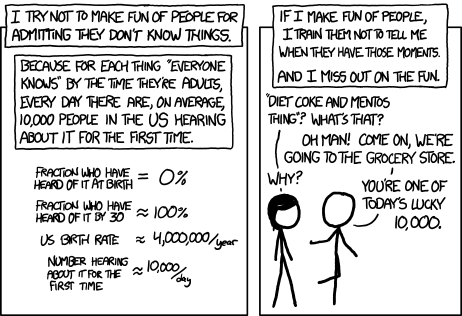 And this reminded me of an xkcd comic that applies - his Ten Thousand. There are LOTS of people at any moment who are new to any "obvious" concept. there's a "right time" to learn something, and it's different for everyone... Each person ... is on a different clock. When I was in graduate school, I remember one of my professors saying how he had pulled together some stuff for a paper, and considered it kind of trivial. However, at some time later someone had contacted him to thank him for writing the paper, as it had been perfect for what he had needed to know at the time. I had two dreams about him after he [his father] died. I dont remember the first one all that well but it was about meetin him in town somewheres and he give me some money and I think I lost it. But the second one it was like we was both back in older times and I was on horseback goin through the mountains of a night. Goin through this pass in the mountains. It was cold and there was snow on the ground and he rode past me and kept on goin. Never said nothin. He just rode on past and he had this blanket wrapped around him and he had his head down and when he rode past I seen he was carryin fire in a horn the way people used to do and I could see the horn from the light inside of it. About the color of the moon. And in the dream I knew that he was goin on ahead and that he was fixin to make a fire somewhere out there in all that dark and all that cold and I knew that whenever I got there he would be there. We are all carrying with us the fire of our own knowledge. Sometimes on our path we arrive to be warmed by the fires made by others, and sometimes others following behind us arrive to benefit from the fire we left behind. And I guess this is obvious.